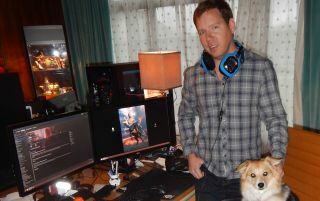 At the PC Gaming Show today, Cliff Bleszinski talked briefly about his return to the PC and the FPS genre. "I wanted to get back to first person—Gears is third person—it's one of those things, that seeing down the barrel of a gun, it's a very powerful thing," said Bleszinski. Going with the PC as the lead development platform enables his studio to be "agile," he added, with things like "test kitchen servers" that allow for easy testing of things like new weapons and levels. And while he has, in the past, said that consoles are where the action is, he insisted that he's always had love for the PC. "I love my console shooters," he said, "but keyboard and mouse for first-person shooters, it's the only way to go."